DALLAS – The Thunder is cruising up the standings in the hotly contested Western Conference, but by no means has it let off of the accelerator. During the Thunder’s string of victories, which included the sweep of a back-to-back set on Wednesday at Cleveland and at home against Houston, the team has shown its versatility. In today’s NBA, you have to have a concrete identity to be successful, but teams also have to be able to adapt to present conditions, adjust and win in various ways. For example, the Thunder has had to grind out victories with ingenuity and creative tactics in its last two wins, whereas it was high-flying offense in Washington, D.C. that generated a win over the Wizards. Especially now with Russell Westbrook out for Saturday night’s game against the Dallas Mavericks uncertain and Andre Roberson still out, the Thunder’s margin for error is smaller. As a result, the Thunder must be able to get stops on command. “Our defense has to hold up for all of this to work,” said forward Paul George. A crucial aspect of the Thunder’s defense, which came to fruition against Houston is not fouling. 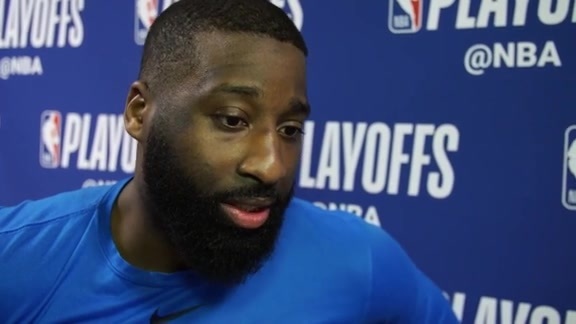 With the new point of emphasis amongst officials on calling grabs and holds, the Thunder’s defensive discipline ensured the Rockets took just 10 free throws in the entire game. Against elusive guards like Dennis Smith, Jr. and Luka Doncic, the Thunder will have to be vigilant that its technique doesn’t slip and it executes its switches and coverages properly. If it does, the Thunder can extend its two-game streak of holding teams to an average of just 83.0 points and 37.4 percent shooting. “On the defensive end, we can provide problems against anyone in this league because we can switch everything, one to five,” said guard Dennis Schröder. With rangy athletes like Jerami Grant and Terrance Ferguson in rotation, hyperactive defense has been a Thunder strength this season, but the Thunder also must execute on the other end of the floor. Donovan’s club wants to be just as committed to recognizing unique situations on the floor and taking advantage of them. If opponents want to employ the same strategy of switching everything on the perimeter, Head Coach Billy Donovan’s group must be prepared to strike, and not telegraph it. On the road against the 3-8, but very well-coached Mavericks helmed by Rick Carlisle, the Thunder must be mentally engaged in one of the most crucial junctures of the game, which it has done at a high level all season: the start of the third quarter. This season the Thunder leads the NBA in net margin in the third period, outscoring teams by 4.8 points on average, and 7.3 points during this seven-game win streak. Just because it has happened in the past doesn’t mean it’ll hold in the future, unless there is continued concentration and buy in from the entire team. “Playing together. Trusting one another. Having each other’s back. Giving it everything we got,” the 14-year point guard stated. 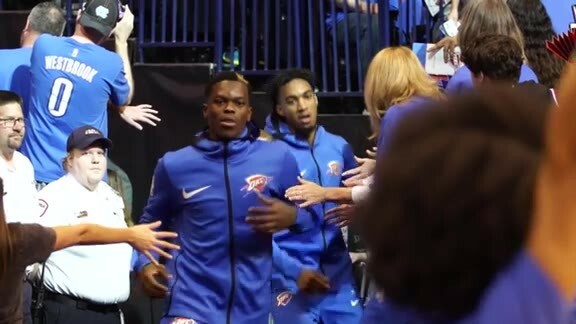 - Through this seven-game winning streak, the Thunder has done an excellent job of playing to its identity defensively and staying truly connected on that end of the floor. A huge aspect of the defensive duties, however, is scouting and game planning against the opposition. With Dallas, that’s a heavy task considering how well they’re coached and the level of talent that permeates their roster. The Mavericks will play an up-tempo style that involves flare screens, over the top lobs to high leapers and both backdoor and flex cuts. In order to deny some of those high percentage opportunities around the rim, the Thunder’s communication and coordination tonight will be crucial. - Despite the veterans surrounding him, the Mavericks’ leading scorer this season has been rookie forward Luka Doncic, who is putting up 20.2 points, 6.5 rebounds and 4.2 assists already through 11 games. No NBA rookie since Michael Jordan in 1984-85 has held up averages of 20 points, 6 rebounds and 4 assists in their first season. - With Westbrook out, it will continue to be George, center Steven Adams and Schröder who lead this Thunder squad through each quarter, striving to help put their teammates in position to succeed during the battle. On Thursday against Houston, George went aflame in the second quarter by knocking down six-straight shots for 14 points, as a part of his 20-point, 11-rebound, 6-assist, 6-steal effort in 35 minutes. It’s clear that alongside Westbrook, that George is very capable to taking control of the Thunder and how it plays, and he’s comfortable doing so. “Paul just plays the game and he finds ways to get himself involved. He can rip off in a two or three minute period, like these runs where he can change the momentum of the game,” explained Donovan. “(George) has a year under his belt. He is very comfortable with us, the system, the whole city, everything, the whole atmosphere,” said Felton. 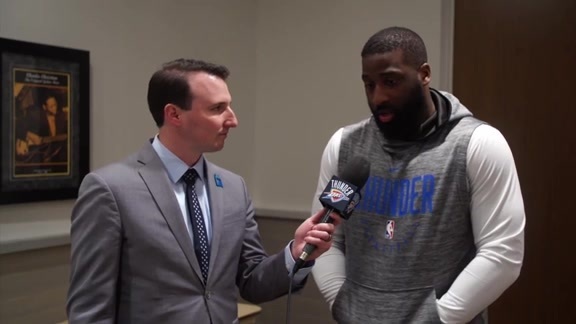 - Another crucial competitor for the Thunder is Felton, who will need to play a significant role in the rotation on Saturday with Westbrook out. In 13 minutes on Thursday, Felton knocked down 5-of-9 shots, including 5-of-8 mid-range jumpers, for 10 points. - Felton’s ability to emerge from out of the rotation to playing key minutes is a prime example of what the Thunder aspires to be – a team with no agenda and full of willingness to play a role. Regardless of who is currently in the rotation or getting the lion’s share of minutes, Donovan has reiterated that every man on the roster is going to be vital to the team’s ultimate success.